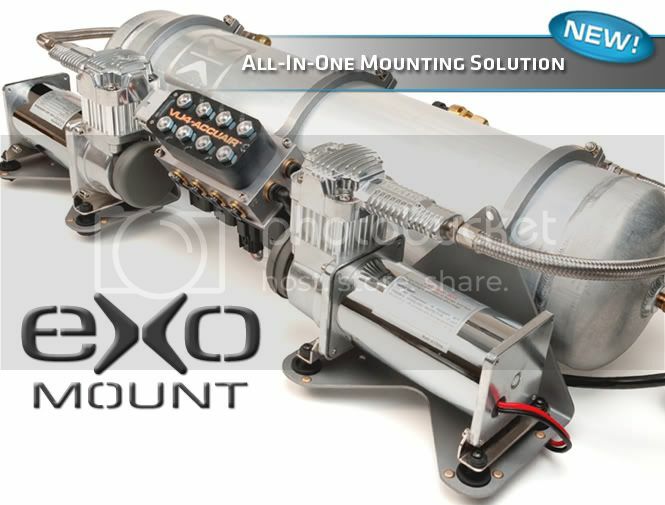 The eXo Mount bracket system integrates air management components into one easy-to-install unit for all vehicles with Air Suspension. This modular design allows the tank, compressors, ECU, and valves to be mounted together in a variety of orientations to simplify installation in the trunk of a car, the bed of a truck, or the side of any frame rail. This system also incorporates AccuAir's new aluminum air tanks in 3 or 5-gallon sizes, and utilizes revolutionary Hover-Mount compressor isolators for quieter operation. The versatility of the AccuAir eXo Mount makes it the perfect air management mounting solution for ALL applications. Click HERE for more features and specs. that is a sick idea!!! You should see it in person, these guys are just killing it wth innovative products! Any worry about cantilevering parts off an aluminum tank? I would think that over time the road vibrations would transfer to the tank from the mounts and cause that area to become brittle and potentially fail.